Double-conversion topology. The Eaton 9SX constantly monitors power conditions and regulates voltage and frequency. With up to 95% efficiency in online double-conversion mode the 9SX provides the highest efficiency level in its class to reduce energy & cooling costs. The internal bypass allows service continuity in case of internal fault. Batteries are hot-swappable from the front panel without powering down critical systems. With its tower or rack/tower versatile form factor the 9SX can be installed in any environment (rack kit provided as standard on RT versions). Stronger, longer battery life: Eaton ABM® battery management technology uses an innovative three-stage charging technique that extends battery life by up to 50%. More runtime can be added with external hot-swappable battery modules, able to run systems for hours if necessary. The additional battery modules are automatically recognized by the UPS. The new graphical LCD provides clear information on the UPS’s status and measurements on a single screen (in seven languages). LCD display position can be adjusted to offer the best viewable angle for tower and rack usage. The 9SX can meter energy consumption. kWh values can be monitored using the LCD or Eaton’s Intelligent Power Software Suite. Load segment control enables prioritised shutdowns of nonessential equipment to maximise battery runtime for critical devices. It can also be used to remotely reboot locked-up equipment or to manage scheduled shutdowns and sequential start-ups. The 9SX offers Serial, USB and relay (dry contacts) connectivity, plus an extra slot for an optional card (Modbus, Network or Relay). 9SX also provides Remote Power off function. Eaton’s Intelligent Power Software is included with each UPS. 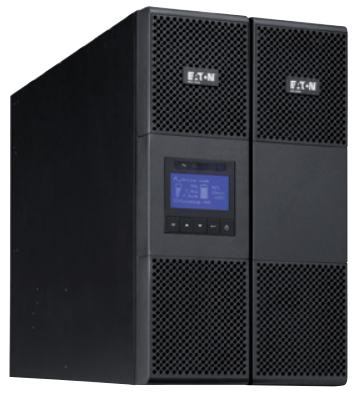 Download the Eaton 9SX Series UPS Brochure (PDF).